I was recently asked to participate in a workshop about the PhD writing process. The idea was to share experiences about the PhD writing process across disciplines. So I set out to reflect on my own writing process as a humanities student and on the different types of writing which have become an intricate part of my PhD journey. The idea for my PhD grew out of a functional piece of writing, a report I was asked to write outlining details of all TG4 documentary films broadcast between the founding of the station in 1996 and 2010 when the initial research for this project began. From the very outset of my PhD I was encouraged by my supervisor to write. I began my PhD in September 2011 and five weeks later I presented an extended version of my initial report at the annual conference in my department. For this paper I took the initial report which was quite factual and reworked it into a somewhat more narrative form, although I did feel at this point that the paper which I presented was boringly filled with numbers and figures. I knew at this point that this piece of writing was quite functional. While it was useful for me to have gathered this information, this was not the form that my I wanted the final product of my PhD to appear in. It would need to be much more narrative. This piece of writing, however, was very much a bounce board or a jumping off point for my project. (i) Mind mapping: I often begin by mind mapping, taking a large sheet of blank paper and writing the main heading/topic under consideration in the middle of the sheet. Then I map out key areas of consideration. Sometimes I will further map out details of these key areas – if I have information/thoughts on these. (ii) Note taking: Next, I find the relevant reading material for the specific section of my project that I now want to focus on. While reading I take notes. This notetaking generally takes place on the computer. I open a new word document for each new article I read. I have tried using endnote also for this in an attempt to help me make my note taking more specific and easier to find. I am not altogether satisfied that I have yet found a methodology that is a perfect fit for me. This is an area I need to work on further. (iii) Idea development: When I have read sufficiently to have a good understanding of the topic under consideration I then turn to writing long form again. At this stage I am using writing to develop my thoughts and ideas. The editor in my brain is given a holiday and the ideas are allowed to flow unrestricted. I tend not to work with headings or subheadings at this stage. I just write. As I am writing I am working through my thoughts and ideas. If I can remember a suitable reference I will put that in as I write but I do not go off looking up exact details of that reference at this point. That would distract from the purpose of this stage of writing. (iv) Further note taking: Sometimes I will feel the need to read further and to take further notes and I take time out from the idea development to do this. (v) Ongoing mind mapping sessions to contextualise: Often, then I will come back to mind mapping but this time the mind mapping is more focused. This time I will focus on the specific area I am trying to tease out. I will however, have a second mind map going which helps me keep note of how this specific section fits into the bigger picture. (vi) Further idea development: When I feel I have read sufficiently and have an understaning of the context of the section I am working on, I will return to writing to develop my idea further. Again, the editor is sent on a brief holiday. (vii) Editing and idea development: When I feel like I have developed my idea sufficiently as to be able to bring it together into a coherent piece of writing the editor is brought in. Initially I reread what I have written and try to tighten up my idea. Next I look to the structure of the piece of writing. Does it make sense? Does it follow a logical structure which shows the development of the idea? Will someone else be able to follow my line of thought? Then, I look back to my note taking and find suitable references to support and strengthen my argument. This process is often slow and painstaking, as futher idea development is taking place alongside the editing. At first I work simultaneously on editing and idea development. (viii) Editing only: There comes a point where I just have to switch off the idea development and allow the editor to work in piece. This is an extremely difficult thing for me to do as I just want to keep refining my thoughts. But, if I am to deliver a piece of writing then this phase is crucial. This is where writing conference papers or journal articles can be particularly useful. A deadline is set and I must deliver. This helps me to focus on one particular area of my topic and to work my idea through. This is in effect what I am trying to do on a larger scale within the PhD. For me each piece or style of writing leads to further writing. I use writing in lots of different ways. I love to use writing to think but I also use it to take notes, to contextualise, to develop and to refine ideas. I write continuously. Ultimately, for the purposes of this PhD, I write to produce a piece of work which allows me to present to a wider audience my ideas and my thoughts on a particular topic in a form that is comprehensible and coherent. Funding applications and thesis chapter layout models which other students shared with me. Funding application writing workshops provided by the Dean of Research in the College of Arts. Funding application review provided by members of my department and by members of other departments in the College of Arts. “The Seven Secrets of Highly Successful Research Students” and “Turbocharge Your Writing” by Hugh Kearns. Poster Design Workshop – led to participation in Synergy poster competition. Blogging workshop with Andy Coverdale which led to the found of the blog Thesis Talk, funded by EXPLORE. 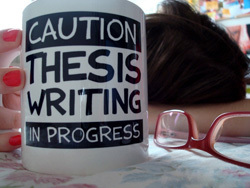 Workshops and one-to-one writing and time management sessions held in the Academic Writing Centre. “Creative Difference” module for Hardiman students held at the Burren College of Art. “Innovation and Entreprenneurship” module for Hardiman students. Ongoing support from members of my GRC and department of Irish who are always willing to review my work and to offer advice and support. The initial stages of idea development where I write and write and write with the editor in my brain compeletely switched off can be very enjoyable, great sense of progress and achievement. The mind mapping stages can often be frustrating and confusing. Sometimes I feel like I am going around in circles. I know now that this is a good thing and that continuing in circles will eventually lead to an eureka moment and to clarity. Note taking can also be frustrating. I just want to read but I am aware that if I do not take notes I will not remember all the great quotes and arguments I read which are so important to the defense of my own idea development. Editing can be painstakingly slow and sometimes makes me despair. Just when I think I have come to an understanding of a particular element of my work and am happy that I have captured it succinctly, I then read back over what I have written only to discover that there is still a lot of work to be done before I will reach a stage where I can present a coherent polished argument. Final stages of editing can be very satisfying. This is where I get to play with words and with the sound of words. This is when I feel all my hard work has paid off. I would be delighted to here about your PhD writing process. Does it look anything like mine…or is it perhaps completely different? Do you have any tips to offer? Yup, my experiences of writing are very similar. I go between the very same methods that you’ve mentioned. I don’t always go in any particular order. Sometimes when I try mind mapping for instance and it doesn’t work I move to another method. I guess I just aim to write a little something everyday and I count editing as ‘something’. The act of even just writing a little something or a big something (on the days when all of the planets are aligned!) is satisfying and also helps to squelch and/or keep at-bay that ‘I’m not doing enough’ sick feeling I get in my tummy. Thanks for sharing.